BU4515DF Silicon Diffused Power Transistor Enhanced performance, new generation, High-Voltage high-speed switching NPN Transistor with an integrated Damper Diode in a plastic full-pack envelope intended for use in horizontal deflection circuits of colour Television receivers an p.c monitors. Features exceptional tolerance to base drive and collector current load variations resulting in a very low worst case dissipation. This is one package pinout of BU4515DF,If you need more pinouts please download BU4515DF's pdf datasheet. 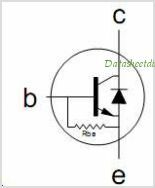 This is one application circuit of BU4515DF,If you need more circuits,please download BU4515DF's pdf datasheet.